One of the great things about coffee is the sheer variety of beans on the market. As coffee roasters, we work with importers and farmers to source green coffee beans. They send us samples to test and then we buy, in quantities ranging from hundreds of pounds to thousands of pounds, based on price, demand and how much we enjoy them. In a few rare instances, we've bought coffees without even sampling them based on certain characteristics or market demand. We roast a lot of great coffees (and some not so great coffees), but only a select few ever make it to our pour over bar or retail bags. It allows us to keep our menu fresh by rotating our offerings seasonally, based on what the market is providing. 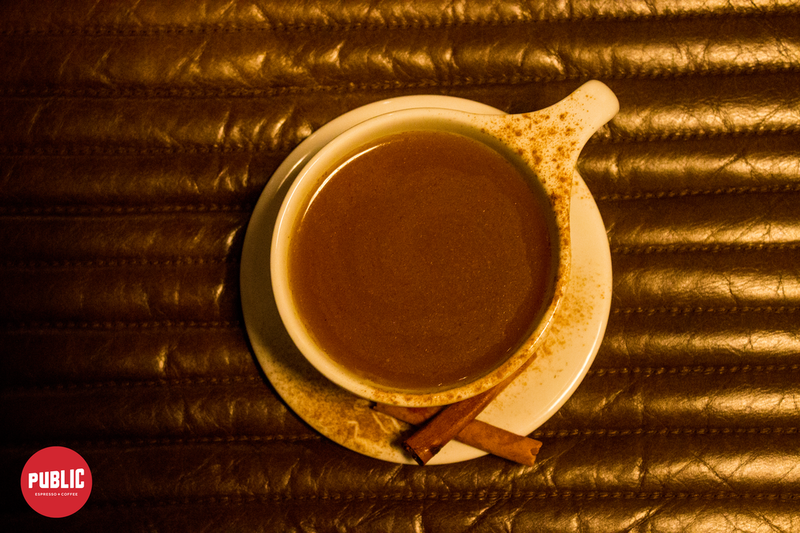 A coffee's lifespan can be anything from a couple of weeks to a few months, based on how much we were able to purchase. When the supply runs out, that coffee is gone and the process starts all over again. It's one of the most exciting things about being coffee roasters and it gives us an opportunity to grow, learn and try new things with coffee almost daily. Which is why we're particularly excited about our current coffee offerings. Our current slow bar menu is one of the funkiest we've had in a while. We're featuring coffees from Bali, Burundi and El Salvador, each with unique roast profiles and palettes. On our menu, the Burundi Kayanza is the lightest roast at the "City" level (something Starbucks would call "Blonde") and it has notes of honey, cantaloupe and jasmine flowers. Long time followers of Public will recognize this next bean because it's one we've featured every year it comes around, that's how much we love it. The Bali Kintamani is roasted at "City +" and has notes of peanut butter, grape and strawberry. Coffee beans are grown and harvested seasonally. A coffee plant takes about 3 years to mature before it produces anything worth picking, processing and selling. The fruit on a coffee doesn't all mature at the same rate either. Particularly in specialty coffee, coffee cherries are hand-picked multiple times during the season when the fruit hits maximum ripeness. These factors and elements like climate, exposure to sunlight and processing method can change the way a coffee tastes from season to season. And that's all before it's even seen a roaster! So while we've featured this particular bean, from this particular region in Bali before, it's a very different coffee with the same DNA as coffees we've served in the past. It usually has notes of strawberry, a common characteristic of coffees from Indonesia, and one year in particular it smelled and tasted like a strawberry patch. This year, the strawberry notes are a bit subdued, but they're buoyed by creamy peanut butter and tart grape flavors. Lastly, we're featuring a complex bean from El Salvador. It's also the darkest roast on our Slow Bar Menu at "Full City". It's a natural process coffee, too. The natural process means that once the coffee cherries are picked, they enter the drying phase. Rather than picking the sweet, tart fruit off of the coffee bean, or pit, the whole coffee cherry is dried in the sun. This process is more environmentally friendly because it doesn't require the washing and soaking phase of many coffee processes. It also results in much sweeter, juicier tasting coffees because of the sustained contact between the fruit and bean. When a natural process bean remains in that state longer than usual, it sometimes leads to a somewhat fermented profile. 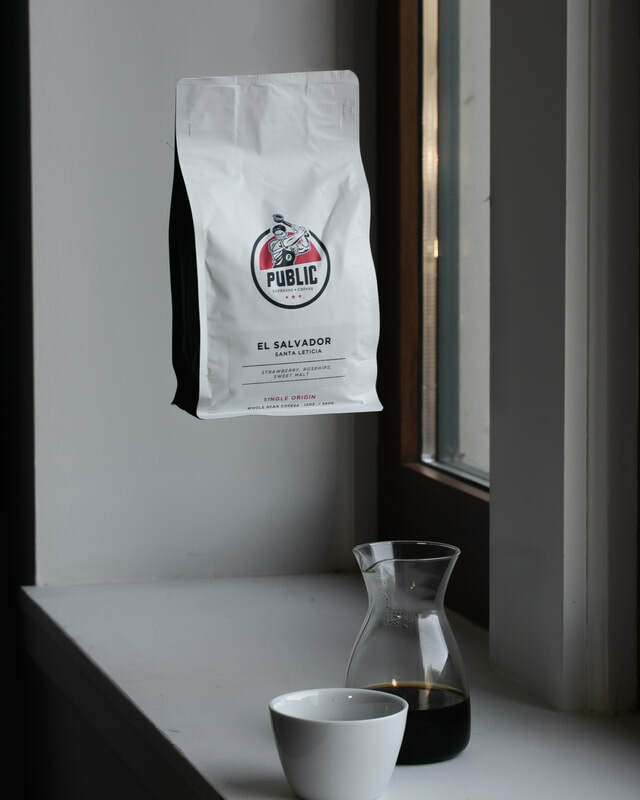 In this particular instance, the El Salvador has notes of sweet malt, rose hips and strawberry. A longer than usual drying phase likely contributed to that malty flavor. All three beans are currently available on our Slow Bar Menu, while they last. 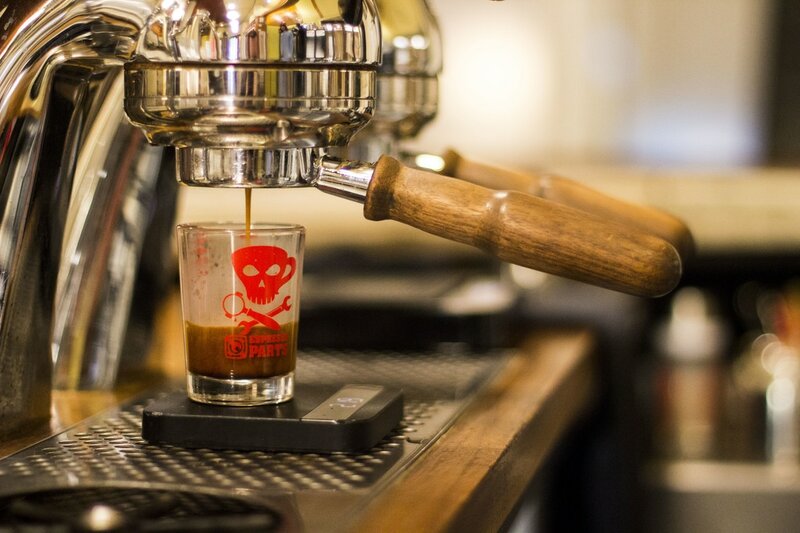 Don't sleep on these funky coffees. 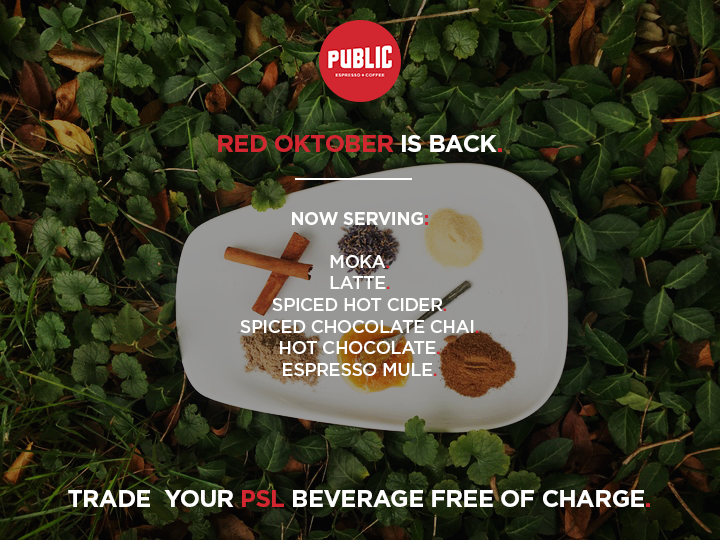 If you want to see a coffee from a certain region make our menu, tweet us at @publicespresso! 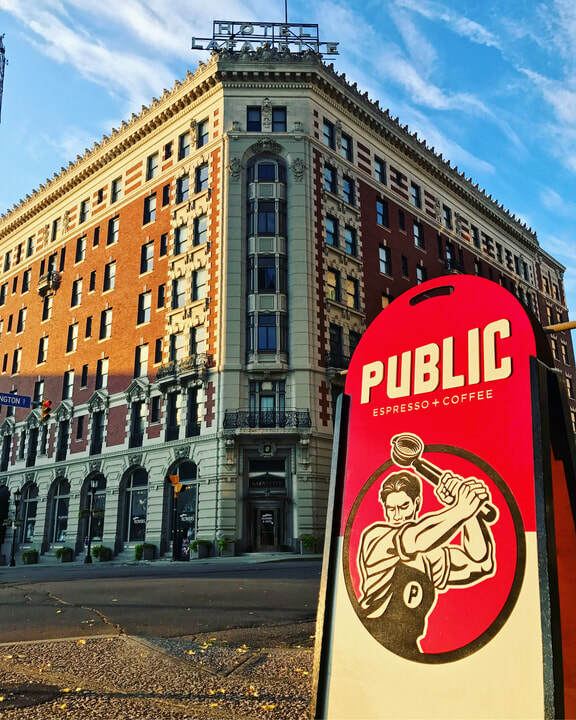 It's been a busy summer at Public Espresso + Coffee HQ. 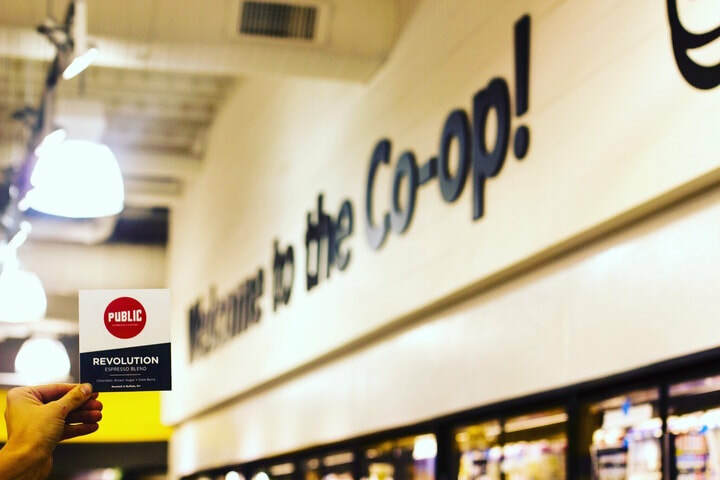 Back in July we secured our first grocery store account with the Lexington Co-op on Hertel Avenue. To our absolute elation, it's been tough keeping coffee in stock since they launched. Today, we're pleased to announce 2 new retail locations that our fresh roasted coffee beans will be available in; the Lexington Co-op's Elmwood location will begin carrying three of our blends and you'll be able to pick up five of our roasts at WNY's first Whole Foods location on Sheridan Drive in Amherst. That's not all we've been working on though. Far from it, in fact. Earlier this spring, the folks at Schneider Development revealed their plans for the renovation of the Shea's Seneca project on Seneca Street in South Buffalo. Eagle-eyed readers spotted clues alluding to a potential coffee shop tenant in one of the buildings three storefronts. It gives us great pleasure to share that we will be opening a cafe in South Buffalo in August of 2018 as part of this project and a larger revitalization effort for Seneca Street. Being from South Buffalo, this project feels a bit like going home for James and I. We can't wait to share more of our vision for that space, but it's still a ways off, so we'll leave that for a later date. For more on the Shea's Seneca project and overall vision for Seneca Street, head over to Buffalo Rising for the scoop! For my sanity's sake, I wish I could say that's all that has been keeping us busy/up at night. But, earlier this summer we were presented with an opportunity that we simply couldn't pass up. Back in March 2015, on a handshake agreement and not a clue about operating a daily cafe we opened our little shop in the lobby of The Hotel Lafayette. We opened with insane hours while two of our three partners were still holding down full time jobs. Myself, James, Matt and Clinton juggled opens and closes, while coming to terms with what it takes to run a business that is open every day of the week. When we agreed to open in the lobby, Rocco Termini offered us 6 months rent-free to gain our bearings. At the end of the 6-month trial, we would either decide it was a failed experiment or draft up a formal lease for the space. Two months in we told Rocco we'd like to sign on for 3 years (or what felt like forever at the time). But operating a small business is a marathon, not a sprint, and in the grand scheme of things, 3 years is kind of nothing. You can do A LOT in that amount of time, but don't be shocked to look back and realize that 3 years have gone by in what feels like 6 months. And here we are, two and a half years later. We've got a shop we're proud of that we get to serve a product we're even prouder of to the folks of Downtown Buffalo. We've got a team of 10+ that each bring something incredible to the table. For what has been called both "Buffalo Best's Hotspot 2015" (Buffalo Spree) and a "Coffee Kiosk" (Buffalo News - never forget (I haven't)), we've got a pretty sweet gig going. We feel we can do more though. So we will. If you've been through The Hotel Lafayette with any sort of regularity this summer, you may have seen (or more likely heard) random construction going on in the corner storefront of the building, formerly Woyshner's Flower Shop. That work is for a new cafe that we will be opening this autumn. It's a space that will allow us to execute a vision we've had for ourselves since the inception of our business back in 2012-2013. Everything from menu to service and natural light is receiving a major overhaul. We're gaining a full-service kitchen to introduce a daily food menu and will be introducing a coffee and tea focused cocktail menu that we can't wait to blow the lid off of. That's not all though. It's always been the slightly quieter aspect of our business, but our roastery and wholesale business operates as the backbone of Public Espresso + Coffee. It's what lets us do what we love to do in our shop or at farmers markets. James and our Assistant Roaster Zach have grown our roasting business into a beast of its own. For the last two years, we've been roasting on Buffalo's West Side . The truth is, we've struggled to strike a balance for that space that could house our roastery and be a cafe we'd be proud to operate. With the rate our roastery was growing and the capacity needed to house green coffee beans (they ship on pallets of 132lb. bags) expanding rapidly, we were running out of space to fit a reasonably sized cafe and roastery. In the last few weeks, we've come to a solution that solves both problems. The Hotel Lafayette has a 3,500 sq. ft. that is fitted with the ventilation needed to run a coffee roastery. It has the space we need to grow our roasting business for the next 10-15 years with a little extra room for a definitely-maybe-if-we-get-our-way bottling line for things like kold brew. It has a loading dock, office space and more. In short, it's perfect. Alright, I've rambled on for long enough. These plans have all come together very quickly, relatively speaking, and we've only just begun to wrap our heads around all of the major changes and what it means for our business, our team and our plans for Public Espresso + Coffee. As nervous as we are, we could not be more excited to see this all come to fruition. We look forward to sharing more of the construction, menu, research and design processes for all of these spaces as we move forward. And we especially can't wait to have you as our guest this fall. If you're looking to turn that New Year's Resolution to exercise more into a full-time habit, join us for the 2017 Spring Season of our Run in Public running club, in conjunction with Next Level Running. This season will run from Thursday, March 9th to Thursday, April 27th and culminates in an optional 5K on Sunday, April 30th. This year, we're targeting as a goal race the 2017 Buffalo Run for Babies, which takes place on Buffalo's waterfront at 9:30am on the 30th. First, if you're hesitant about committing to the full season, join us this Sunday, February 5th at 9:30am for a free group run and informational session at our shop in the Hotel Lafayette. For those attending, early bird pricing will be available for the full 8-week Spring season with the club. Each Thursday, we meet at 6:15 am and beginner and advanced training plans will be provided and different length runs (1-5 miles) will be planned each week. Melina of Next Level Running will be on hand to moderate group runs and will be available to members for additional training advice and information. In addition to 8 group runs and a professional training plan, membership will also get you a group t-shirt, weekly deals at our shop and more. If you can't attend this Sunday's free group run, Early Bird pricing is available through our website for the next 3 days. This is the only time the discount will be made available, so don't hesitate to pull the trigger! Ever wondered why your coffee tastes different when your favorite barista makes it, compared to when you prepare it at home? 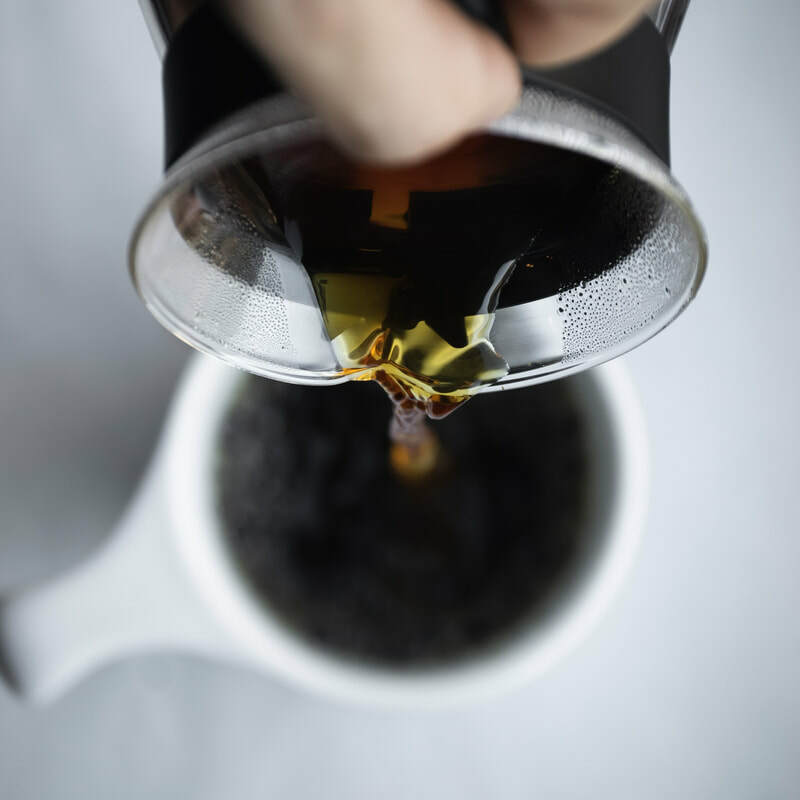 There are a ton of factors that can influence the outcome of the brewing process; everything from equipment, water temperature, coffee freshness and grind size to dosing, timing and human error. We've made a resolution in 2017 to highlight and educate on a variety of topics impacting coffee and espresso brewing methodologies through a series of Monday evening bar classes we've dubbed Assembly Nights. We are constantly looking for ways to broaden our horizons while also looking for outlets to share our passion with others. So, we've developed Assembly Nights to help kick things off. Monday nights, beginning in February will be all about education and we want to invite you to be a part. 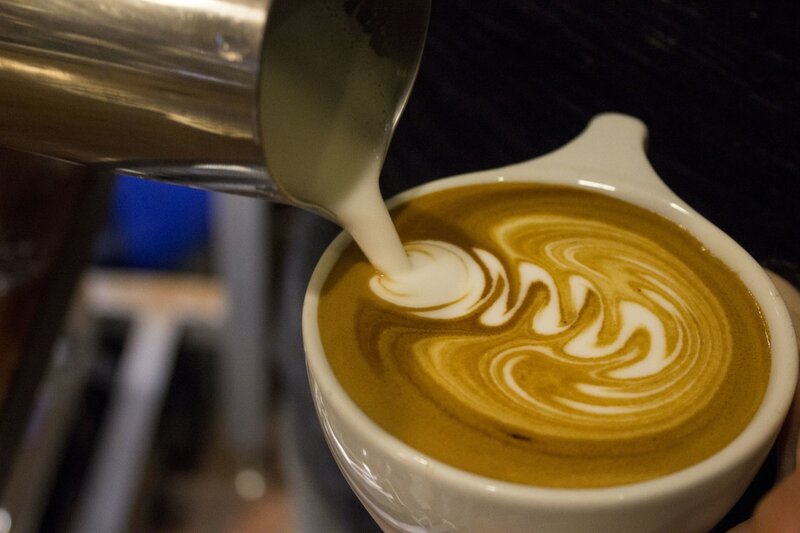 Right now there are 8 classes lined up, covering a wide variety of topics related to coffee, espresso and more. Classes are $15 each and will be moderated by our Head Roaster James and Head Barista Clinton at our shop in the Hotel Lafayette. Each tightly-focused class will be roughly 45 minutes to an hour long, with enough structure in place to move things along while also allowing a fluid dialogue and discussion throughout. They are also limited to 10 seats per class, so spaces won't last long. As you can see, everything from perfecting your v60 pour to learning the basics of steaming milk and pouring the ever-instagrammable latte art. Some classes will be more hands-on than others, offering a chance for volunteers to step behind the bar and put that week's lessons into practice. We've even designed a class around the coffee liqueur we collaborated with Lockhouse Distillery on. They'll join us to walk you through the basics of the liqueur and some simple, amazing drinks you can make with it! Head to our shop page to reserve your tickets now. If a class is sold out, don't worry, there will be future dates added, particularly on more popular classes. Game Day. The Buffalo Bills vs. The New England Patriots. A meeting of giants; a sportsball clash of the titans, if you will. For many Buffalonians, time stops ticking and the outside world ceases to exist for those few hours on Game Day. For the others, the outliers and non-Bill-ievers, finding something to do on Game Day can be more daunting than a 4th & goal attempt from the other teams tee box, or whatever. Which is why we created Alt. Game Day, to give the others something to live for. Think of Alt. Game Day as The Upside Down from Stranger Things, except there's lattes instead of monsters and Barb's still alive. The inaugural Alt. Game Day will kick-off (buckle in) on Sunday, Oct. 30th at 11am ahead of the Bills vs. Pats game. We've gathered a collection of modern and classic board games, card games and more for those looking for a little something different. There may even be some Mario Kart & Goldeneye N64 setups. You read that right. They'll only be available on Alt. 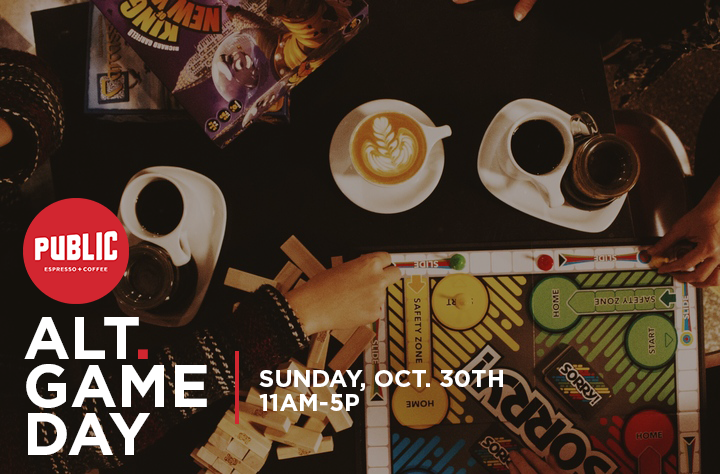 Game Day so if you want to give them a try, you'll have to stop by the shop on Sunday, October 30th between 11am-5pm.